A clean and well-maintained attic and crawl space provides assurance of good health and safety for you and your loved ones. Unfortunately, the attic and crawl space areas are often overlooked and get less attention from homeowners. Unattended attic and crawl space could mean problems in the future. A systematic maintenance plan and periodic inspection can go a long way in eliminating persistent issues and making homes cleaner, more comfortable and energy-efficient. Let Quartz Solutions take on the process of monitoring and improving your attic and crawl spaces. Keeping the attic and crawl spaces clutter-free, clean and well ventilated can safeguard your family’s well-being and defend your home against unforeseen, and costly damage. Duct systems with trickles and broken-down insulation can spike monthly power bills and spread harmful bacteria and germs, right into your living space. 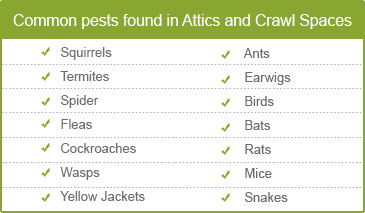 Pesky insects like wasps, roaches and termites can eat away at the property’s structure. Vermin nesting not only ruins structural portions, insulation, and cables but also leaves behind a chaotic mess. Excessive moisture and humidity breed mold and mildew that impact the home’s indoor air quality. A wet and moist environment promotes wood decay, leading to costly structural damage. An inspection of your attic and crawl space is the first step towards keeping your home and family safe and comfortable. Testing for radon gas, a known carcinogen is also crucial. Our crew of expert technicians will assess your home or business absolutely for free, and will provide clarity on the issues that need to be fixed. Our primary aspiration at Quartz Solutions is much bigger than just making money. We want to satisfy our customers without making them break the bank. Hence, we offer services at affordable rates. Morristown in Morris County, NJ, popularly referred to as the military capital of the American Revolution, has a glorious history that has been beautifully preserved by its residents. We at Quartz Solutions would like to pitch in and do our part in protecting the people, homes, and business establishments in the area. How? 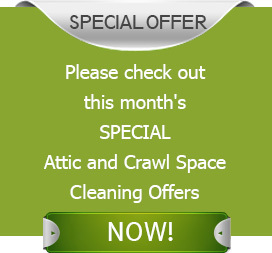 By offering the best cleaning solutions for attic and crawl spaces. Call 973-536-1013 to connect with Quartz Solutions for a complimentary inspection and consultation.